Remove the rear side door trim panel. 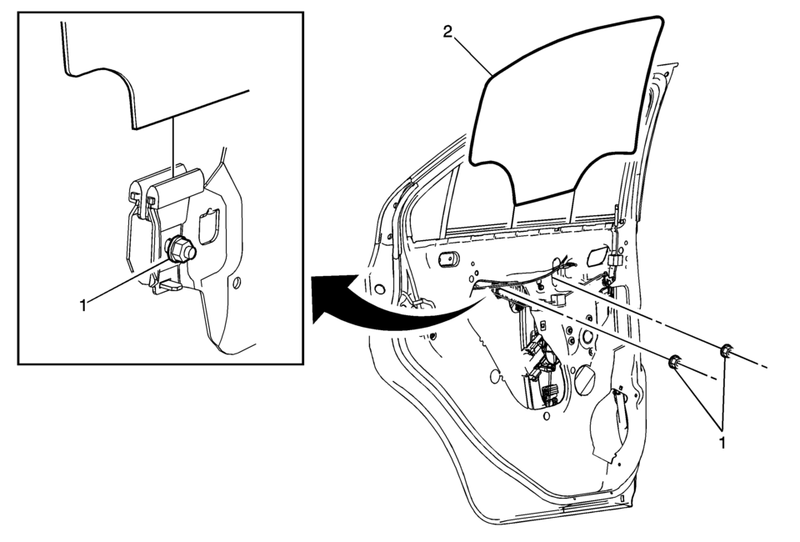 Refer to Rear Side Door Trim Replacement. Remove the rear side door rear guide. Refer to Rear Side Door Window Rear Guide Replacement. Remove the rear side window outer sealing strip. Refer to Rear Side Door Window Outer Sealing Strip Replacement. Loosen nuts on the guide so that the window can be removed. Align the window guide with the access holes in the inner door panel. Install the window to the guide. Carefully move the regulator upward for short slow intervals, while ensuring that the window remains in the guide. Tighten the nuts to the window guide.